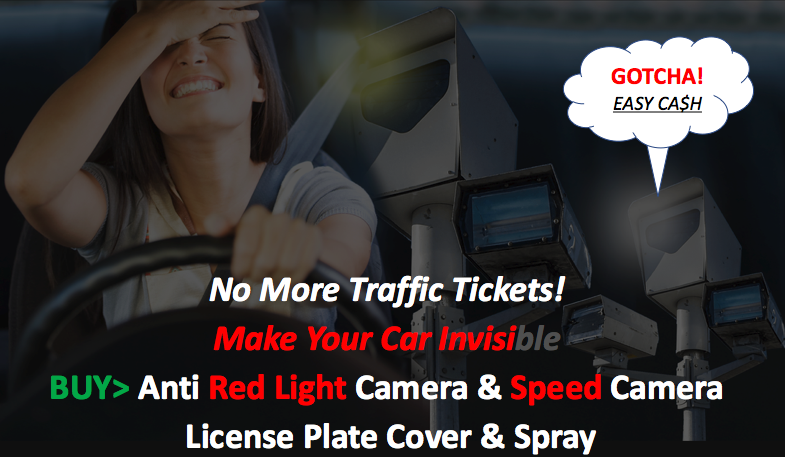 ​Products that beat toll, red light & speed camera ​tickets. HOW TO BEAT TRAFFIC TICKETS! NOTE: We do not condone the use of our product to beat toll booth cameras! 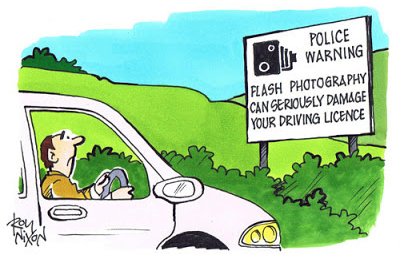 A majority of red light & speed cameras utilize strong flash to photograph the license plate on your car. 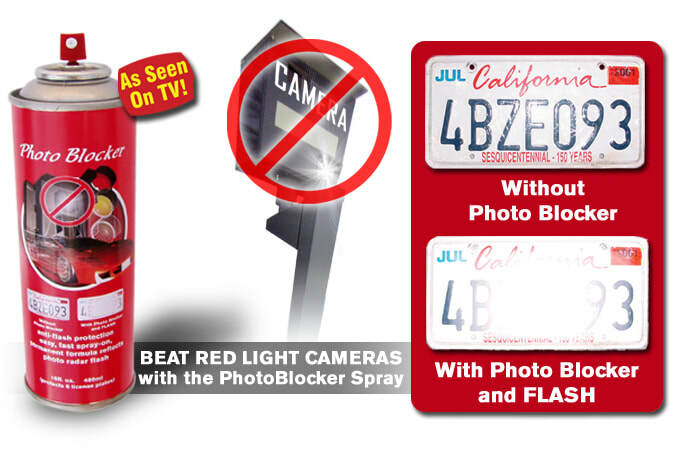 Once sprayed on your license plate, PhotoBlocker’s special formula produces a high-powered gloss that reflects the flash back towards the camera blinding it. This overexposes the image of your license plate, rendering the picture unreadable. Unreadable Tag = No Ticket! ✓INVISIBLE to the naked eye! ✓​BEST alternative for when you can't use an anti-camera license plate cover! ✓One can covers FOUR license plates! buy PHOTOBLOCKER SPRAY! Click here! Earn $500/day or 20% commission! JOIN our affiliate or Dealer program. Potential to make $2,500 - $10,000 a month. No kidding! If you have a facebook page, twitter or instagram account, then simply post your own custom link, share and cash in. It's that easy to earn up to $500/ day. 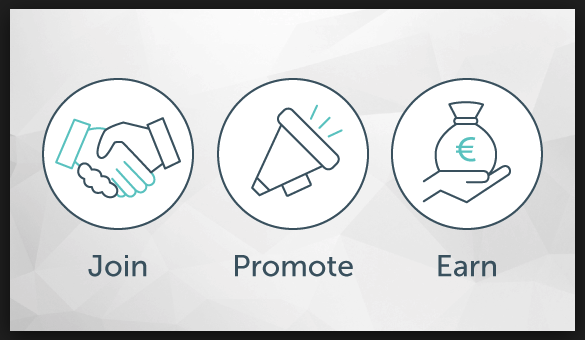 If you own or manage a website, a discussion/chat forum, belong to an on-line club or own a mailing list, you can earn a generous 20% commission on every sale. It's that EASY! It's easy, it's fun and it's a great way to alleviate your fellow drivers concerns about receiving unjust traffic tickets in the mail. You will receive personal email ads, banners and promotional videos. Police Tested. Proven To Work. Beat Red Light Camera Tickets! Banned In California... Cuz It Works! It works. Watch media test! Email me FREE eBook - Am gona Fight my ticket! Get your FREE eBook Now + Free App + 50% Coupon! Fight Back: How to fight red light and speed camera tickets. 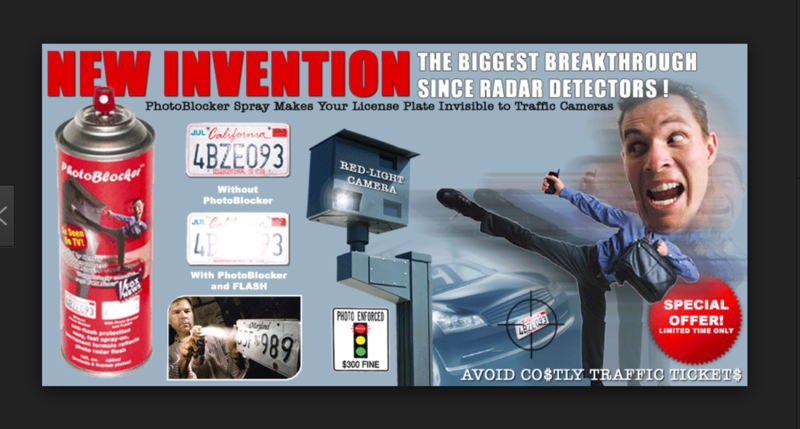 eBook will show you top 20 tricks to get out of traffic camera tickets. Authored by a traffic court judge and attorney. Worth $39.99! Now FREE! 100% Legal! 20 Years Experience. 3,823 Cases Dismissed. Don't Pay That Ticket! Fight Back & WIN! Find Out How. Get Your Free eBook Now! Our team had 3823 traffic court cases dismissed by simply following the instructions we are providing you in this eBook. You, too, can have the knowledge to fight back & Win. You’ll learn what documents to ask for in such defenses as “Discovery”, "Material Omission" and “Engineering” defense and what to look for in a “Defect On The Ticket” defense and much more. We’ll explain the laws that allow such things as trial by camera and the “cash cow” profits of the red light and speed camera tickets. Take a stand against unjust traffic tickets. ​It's your money. You worked hard for it. Testimonials - Drivers Who Beat Their Tickets! Result: She won. Case dismissed. How? The Wrong car ticketed, “Defect on the photo and video” strategy. We told her to argue the basic elements of the red light camera violation error tip. First violation photo did not establish that the camera flashed when she entered the intersection. The video proved it was the car in front of her that trigger the flash. A $360 ticket dismissed. Must Watch Video - How Donya Beat Her Ticket! Case 2: Mark received a $75 red light camera ticket in the mail. It was so long ago that he wasn’t immediately sure what had happened. Then he remembered. An ambulance had been coming up behind him, lights and sirens blasting. There was nowhere to go. He pulled through the intersection. Eventually, the ambulance drove past. The problem? The red light camera was triggered Mark got a ticket. However, the photo on the ticket didn’t show the ambulance. He called us. Result: We won. How? The “Discovery” defense. The city could not provide history of ambulance runs. They didn’t provide any discovery. Mark asked the city for the violation video evidence and they could not provide it. No evidence, no case dismissed. $75 ticket dismissed. Case 3: Susie and John were shocked to receive five speed camera tickets in the mail. They had no recollection of speeding. Then they noticed the address. It was near a hospital. It was during the period when their 10-year-old daughter was in intensive care at a Children’s Hospital. How to contest the tickets was not clear. But how to pay the tickets was in bold type on the violation letter. Five days later they received four more tickets for the same location. They called us. Result: We won on seven of the tickets! How? We applied the “Engineering Survey” defense and the “Lack of Legally Sufficient Notice” strategy. ​We asked the city for the engineering survey that should show the speed limit was authorized and appropriate for the stretch of the road. They could not provide study. We asked for city to show tickets were mailed with in 30 days of violation. They were not. Case dismissed. Hundred$ of dollars saved. Must Watch Video - We Won! Case 4: John received a $150 speed camera ticket in the mail. The photo was dark and the license plate was not recognizable. it was blurred. Also, The ticket read “South Capital Street” but it did not look like it. It should have said North Capital Street. He called us. Result: We won. How? The “Defect on the Ticket” strategy. The evidence provided was not clear and convincing enough. First, wrong street listed on ticket. Second, the photo was not legible. You could not make out the license plate numbers. Therefore, there was a material defect on the ticket. Illegible Tag = No ticket. Case dismissed. He saved $150. Must Watch Video- We Won! Case 5. Scott received a $436 red light camera ticket from Daly City and he took the case to court, and he WON! He argued Daly City's contract with the camera maker Redflex violates the state vehicle code, specifically the regulation of the signs warning drivers there are red light cameras ahead. The law states that the responsibility for the signs may not be contracted out to camera makers, that the city must inspect and maintain them. The city failed to follow the law. He went to trial. Result : He Won! The commissioner agreed with Scott and dismissed the $436 ticket. Redflex, the red light camera company violated the state vehicle state code. Make Your Car Invisible To Police Cameras! Avoid Red Light Camera Ticket? Beat Red Light Camera Ticket? Hate Red Light Camera Tickets? exploit the tragedy that happens at dangerous intersections, be sure to hold on to your wallet and smile for the camera. amendment rights of others prosecuted by ATES since July 31, 1999. 1. According to the mandate established in the D.C. Coda, section 11-921(a)(S), this court has jurisdiction to hear this matter. 2. The incidents described in this complaint took place in the District of Columbia. of just surrendering your wallet unfairly to the government, you can learn what you need to know to fight those tickets honestly and legally. The PhantomALERT team have had 3823 traffic court cases dismissed by simply following the instructions we are providing you in this e-book. You, too, can have the knowledge you’ll need to fight back. You’ll learn what documents to ask for in such defenses as “Discovery” and “Engineering” defense and what to look for in a “Defect On The Ticket” defense and much more. We’ll explain the laws that allow such things as trial by camera and the “cash cow” profits of the red light and speed camera tickets. In addition you’ll be taking a stand against the “big brother invasion of privacy” techniques of our legal system. is reason enough to learn how to fight back. To paraphrase Ben Franklin, those who would sacrifice liberty in the name of safety deserve neither liberty nor safety. Automated Traffic Enforcement (ATE) is the fancy phrase for “cash cow.” When liberty and respect of law-abiding citizens is sacrificed in the name of “safety” the rationale tends to be money. This is your money! If your government will not protect your money then you must fight back. There are three principles in this book—each applied to one of the three chapters. The first principle----knowledge is power-- is applied to chapter one that provides perspective and tools for debate and action. You’ll learn how the population has been manipulated into voting in photo ticket laws and how “trials by camera” have evolved. The second chapter prepares you for the fight showing the reader why the second principle is true -- there is nothing to fear. It reminds you of “safety and power in numbers” by providing you with the results of world-wide studies. It makes it clear that you are not alone and that you, as a victim of tickets for cash scheme, are on the right side of the fight. Then, manned with knowledge and freedom from fear chapter three takes us to the third principle fighting back works – when you know how to fight. It also feels good. Knowledge is positive and creates confidence. Fear is negative and can cause ineffectiveness or paralysis. Often victims will just pay the ticket because of the fear that they can’t win. Fighting back creates pride – and can save you money. The final chapter is the call for action. You will learn the tricks you need to fight back. 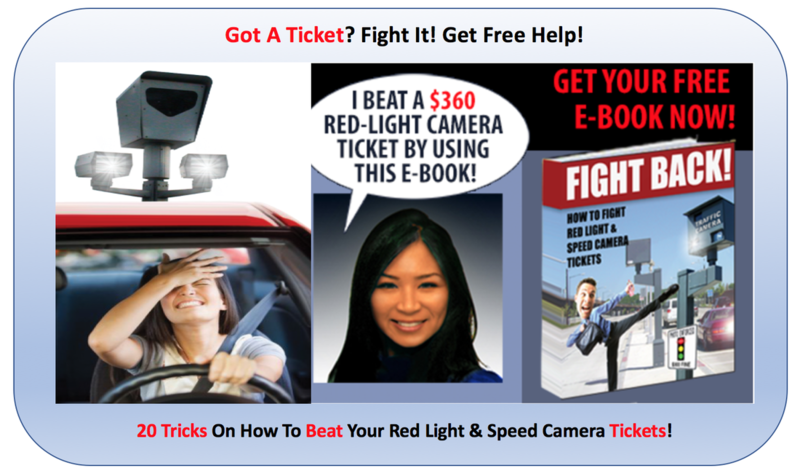 "Fight Back: How To Fight Red light and Speed Cameras"
See Them Before They See You! In early October, I received a citation in the mail citing that I had committed a red light violation a few days earlier that would cost me $361, plus a transaction fee. The photograph on the citation, endorsed by the City of San Bernardino, did not clearly illustrate to me what violation had occurred because the caption did not correspond to my action in the picture. Needing more evidence, I reviewed the accessible online video. Instantly, I realized that a photograph was captured prior to my entering the intersection and that the vehicle in front of me had activated the camera. Fighting Back and Winning. It’s possible. Case 1: Susie and John were shocked to receive five tickets in the mail. They had no recollection of speeding. Then they noticed the address. It was near the hospital. It was during the period when their 10--year-old daughter was in intensive care at a Children’s Hospital. How to contest the tickets was not clear. But how to pay the tickets was in bold type. Five days later they received four more tickets for the same location. They called me. Result: We won on seven of the tickets! How? The “Engineering Survey” defense and the “Lack of Legally Sufficient Notice” strategy. Case 2: John was in the hospital - under sedation during an operation. Thirty-five days after the operation he received a ticket in the mail for running a red light. He knew he was in the hospital that day and could not have been driving. The city said because he owned the car he had to tell them who was driving or he must pay the ticket. He was sedated and no family member remembered having the car on that day, at that location. The city held him liable. He called me. Result: We filed a class action challenging the law-the “Innocent Until Proven Guilty” strategy. The process was a violation of due process because it created a mandatory presumption. The appeal is pending. The courts have been reviewing it for more than a year, apparently considering that the photo ticket scheme makes owners guilty with no real chance to be proven innocent. Case 3: Sixty days after the ticket indicated that he ran a red light, Mark received the photo in the mail. It was so long ago that he wasn’t immediately sure what had happened. Then he remembered. An ambulance had been coming up behind him, lights and sirens blasting. There was nowhere to go. He pulled through the intersection. Eventually, the ambulance drove past. The problem? The photo didn’t show the ambulance. He called me. Result: We won. How? The “Discovery” defense. They didn’t provide history of ambulance runs. They didn’t provide any discovery. Case 4: Susie received a speeding ticket in the mail. The location was a thruway in the middle of the city where the average speed is about 40 to 45 mph. The ticket said the posted speed was 25 mph. If you travel that slowly you could create a hazard. Result: We won. How? The “Engineering Survey” defense. The city had no proof that they had completed the required speed survey. Case 5: Donya received a ticket in the mail. She had no recollection of running a red light. She checked the website and viewed the ticket. She needed help and called PhantomALERT. The photo showed that the camera flashed when a vehicle just ahead of her went through. It had flashed even before she made it to the stop line. Result: She won. How? The “Defect on the Photo” strategy. We told her the basic elements of the red light violation, and the photo did not establish the camera flashed when she entered the intersection. Case 6: John received a ticket in the mail for speeding. The photo was dark and the location was not recognizable. The ticket read, “S. Capital Street,” but it did not look like it. He called me. Result: We won. How? The “Defect on the Ticket” strategy. There was no direction of travel indicated and the evidence provided was not clear and convincing enough on the issue of where this happened. Additionally, the photo was not legible. Therefore, there was a material defect on the photo. Both arguments were winners, but once the ticket was defective, the ticket was dismissed. Case 7: Bob received a notice in the mail that he had failed to answer to three photo speed tickets. The violations allegedly occurred one year ago. There was no photo with this notice and the fines had doubled. He was directed to pay the fines or have his license suspended. He had moved to another state about ten months ago, and thus went to the local DMV. They said he could not have a hearing. He called me. Result: We won. How? The “Basic Element of the Violation” strategy. The government contractor had mailed the actual photos to an address that was more than a year old. Bob had not received a notice and could not be held liable. Case 8: Joe and Berit’s daughter, Jessica, was admitted to Children’s National Medical Center with a congenital heart disease requiring life-saving surgery. She was on a breathing machine and a heart lung machine. Driving to respond to emergency calls from the hospital, the couple received ten photo speeding tickets in one month. All the notices came together. It was overwhelming. They heard about me and the class action to stop the photo ticket program, and called for help. Result: We won eight of the tickets. How? The “Legally Inadequate Notice” and the “Defects on the Ticket” strategies. The government had not sent notices of the tickets within thirty days of the alleged infractions. It was not fair to send ten tickets at once, especially when the driver had no reason to remember what happened and was terrified about the prospect of their baby dying. Case 9: Lillian received a photo speed ticket. The photo was too dark to see markings on the road or road signs. This was a fixed post camera, meaning no office had monitored the equipment. They called me. The “Defect in the Photo” strategy. There are two kinds of speed tickets: fixed post or vehicle mounted. When the photo is taken by a vehicle mounted camera, a person is sitting in a car and the target vehicle must be within a triangle in order to be liable. When the ticket is from a fixed post, the government places markings on the road, five feet apart, which are used to determine the speed. This was a fixed post camera mounted on a pole on the side of the road instead of in a police car. The photo was too dark to identify the markings on the road. They could not legally determine the speed. Case 10: Mike received a red light ticket. It appeared that both the red and yellow lights were illuminated. He called the government and asked for the ticket to be dismissed. They told him to pay. He called me. Result: We won. How? The “Defect in Photo” and the “Discovery Demand” strategies. We demanded discovery of the calibrating and testing of both the camera and the red light. The government failed to provide the requested information. Even though they should have dismissed the ticket after one look at the photo, they were forced to dismiss it as a matter of law once they could not show proof that the red light equipment was working properly. Case 11: Officer Talbert was responding to a call for help from a fellow police officer. He activated his caution lights and proceeded. He received both a photo speeding and a photo red light ticket. He told his sergeant to notify the government that he was driving to assist an officer. Result: We won. How? The “Discovery Demand”, the “Defects in Photo” and the “Special Emergency Circumstances” strategies. The fact of a Code 1 response was not good enough to make the government dismiss even a police officer’s tickets. We had to make the discovery demands—which were not answered—and we looked carefully at the photo. It seems that the photo could show a flashing light on the top of the police car but they could not determine what color it was. If it was white it was not classified as a Code 1 and may not be dismissed; if red it had to be dismissed, according to policies. Even the cops have a tough time fighting back. Case 12: Ian received a red light ticket. There was a box in the top right corner[TJ1] that he did not understand. He called me. Result: We won. How? The “Defect on Ticket” and the “Dilemma Zone” defenses. That box was supposed to show the time when the light was yellow before it turned red. The time was less than three seconds. That’s not long enough. Case 13: Jacob received a photo speed ticket. The typed numbers in the box were legible. However, there appeared to be some hand-written numbers that were inverted! What could that mean? He called me. Result: We won. How? The “Defect on Ticket” strategy. That hand-written number was a control number placed by the contractor or the officer who processed the photo. It authenticates that the photo on the ticket is the photo for the alleged violation. That number connects the camera to the photo. Case 14: Mary B received a red light ticket. The photo did not show any roadway markings such as, crosswalk or stop lines. She called me. Case 15: Brad received a speeding photo ticket. The car on the photo seemed to be his, but he had no recollection of being at that location. He called me. There are laws. There are regulations. There are rules. And then there are tricks. YOU DO NOT NEED TO KNOW ALL THE LAWS. YOU JUST NEED TO UNDERSTAND THE PURPOSE and BASIC ELEMENTS OF THE LAWS so that you know HOW TO WIN. Let’s be perfectly clear: Your local government has, or will have, Photo Radar Programs to make money. Since that is not a politically smart objective, your local government claims a need for increased safety. The problem is that the laws in place do not allow “trials by camera.” There must be a human accuser. To avoid this roadblock to collecting ticket fines they must pass laws, rules, and regulations in the name of safety that justify the profit `motive. The process is started by legislation. In the beginning, the photo enforcement law was “only a bill that’s headed up to Capitol Hill…” Remember the cartoon? Today, at least five states and the District of Columbia have a photo ticket law. The other forty-six states are considering bills that would spread the plague. Politicians are talking about legalizing this cash cow and they will add or delete hundreds and possibly thousands of words. This is why those in states that do not already have camera ticket laws must fight back and take a stand now. A bad idea is easier to stop before it becomes law. Once a law, it is included in the legal code for your jurisdiction and it can take years, great pain, and cost taxpayers a lot of money to repeal. Furthermore, government agencies are granted the power to create regulations to enforce the law. They are given the authority to interpret what the law means in practice, and they must write regulations (for the victims of these tickets for cash schemes) to review. They also have the power to write Rules and Procedures. These are internal policy statements to tell government employees, such as clerks, police, and even judges, how to enforce the law and collect fines without appearing to take away our liberties. These liberties tend to be well accepted notions of legal fairness such as the right to due process, which includes the right to confront your accuser, or the general principle that we are innocent until proven guilty. In stark contrast, the photo ticket laws place the burden on the citizens to prove their innocence.. It is this basic contradiction that these new laws hide within the words. Instead of being innocent until proven guilty, they have established a trial by camera and a presumption of guilt. And instead of being able to confront your (human) accuser the machine is now your accuser. THE PURPOSE OF THESE LAWS IS TO ALLOW TRIAL BY CAMERA. There are two statements of law that control camera ticket trials – (1) the Underlying Infraction and (2) the Enabling Legislation. The problem is not the underlying infraction but the so-called enabling legislation. This is the new law that makes the camera your accuser. The underlying infraction is not new—it is the statement in the law that has always told violators and law-abiding drivers what it means to run a red light or speed. It is called the “underlying infraction/violation” because it is the basic, underlying problem that the new camera law seeks to enforce. Generally it remains unchanged with the introduction of the camera law. This means that the standard of proof (preponderance, clear and convincing, or beyond reasonable doubt) and the elements that state the violation remain unchanged. legal rights. The law is written to make it inconvenient and very difficult to fight back. The enabling legislation is the legal code resulting from the bill. Its purpose is to enable or allow a camera to substitute for eyewitness statements of a law enforcement officer. These new laws provide the basic framework and authority for automated photo tickets to be issued, mailed, adjudicated, and fines collected. As a matter of law, it authorizes the courts or agencies to allow the introduction of photographic evidence of a moving violation to prove their claim. As a practical matter it states how to collect your money while giving the appearance of fairness. With this objective in mind the new laws also determine important details such as whether the cameras used will take one photo of the rear tag, or a second front-view photo of the operator, or if the government must authenticate or provide proof that the camera was calibrated or tested. These can be critical details as they establish the legal smoke screen necessary to justify a trial by camera. The laws tend to be similar throughout the world. Remember, you are not alone. This plague not only affects your hometown but hometowns as far away as Canada, England, Australia, Germany, and Japan. One reason for the similarity is that these bills are routinely drafted by the same lobbyists and big business interests who encourage local officials to buy or rent the photo radar equipment. If you have read an enabling legislation, you have a feeling for all of them. This legislation takes away the right to confront a human accuser. They allow a camera to be your accuser. Many do not require that the camera be calibrated by an independent laboratory, thereby giving a measure of reliability to any self-test. Most do not even require that you be personally identified as the operator and, some let the photo be evidence without authentication. This means that you are guilty because the photo says so. It is also difficult to challenge the authenticity of a photo when the government does not have the burden of authentication. In theory this may be ok for red light tickets because a color photo can show the color of the light. However, this is a special problem for speed tickets because photos cannot show speed. You must trust that the numbers and markings on the photograph have not been tampered with and are correct. When was the last time you felt comfortable trusting the government? Translation – the court will allow the photograph of an alleged violation to stand alone as the only evidence of the violation; there is no requirement that the government proves the camera was calibrated or working properly. Translation: Guilty Until Proven Innocent. The owner is not presumed to be operating the car; instead the owner is guilty because they are the owner. That’s a quick collection too. And the only way to get out of the ticket is to snitch on a relative, friend or stranger in a notarized affidavit. That’s very inconvenient. This small excerpt of the enabling law is only for perspective. YOU DO NOT NEED TO KNOW all of THE LAW. The law includes pages and pages of legal text in addition to legislative history and case law. It is dynamic and changes as legislatures around the country face the issues raised by these camera cash cows and people continue to bring lawsuits to challenge them. It is the lawyers’ job to know the law. It’s your job to know the purpose of the law and how to win. The purpose is to collect fines while giving the appearance of fairness. As the purpose is inherently flawed there is always an opportunity to win. When the purpose actually becomes safety I’ll write another book. There is nothing to fear…You are not alone. What do the states of Virginia and North Carolina have in common with Australia and London, England? They all have made comprehensive studies of the safety impact of Photo Camera Ticket programs. Each found an increase in the number of accidents at intersections where Photo Red Light Cameras were placed. What do the City of San Bernardino, California, the City of Baltimore, Maryland, and The District of Columbia have in common? They each released studies suggesting that red light running and speeding decreased when the cameras were used as mechanical enforcement tools. Coincidentally, each increased the cost of red light and speeding tickets after placing Photo Red Light Cameras in their arsenal. Also, each has used the trick of reducing the wait time on the yellow lights—even when it was clear this action could cause accidents. For example, in San Bernardino, the cost of a red light ticket was increased to $271! In Baltimore, they decreased the yellow light delay, which increased the number of red light tickets, but contributed to rear-end collisions. In the name of “safety” these jurisdictions disregard the studies that prove these actions increase the safety hazard. Instead, their goal was to increase the number of tickets issued and then increase the cost of those tickets to maximize the profit. This logic was not lost on the District of Columbia either as the methodology was employed to generate $122 million in new revenue. How do you have more tickets but decrease red light running and speeding? That’s not logical. It’s your call. No less an authority than the U.S. Congress concluded that although red light cameras present an attractive option for those interested in collecting additional revenue, if there really is a red light running problem all they have to do is lengthen the yellow light. The safety standard for light controlled intersections is commonly called “The Dilemma Zone.. This is the point just before you enter an intersection when you do not have time to stop. If the yellow is timed properly, the average driver with average reaction knows when they are too far away to make the light or too close to stop safely. When the time of the yellow light is shortened, you don’t have a fair chance. The city of Baltimore, was caught decreasing the length of their yellow lights from approximately four seconds to less than three seconds. The records of their actions were broadcast on the evening news. The intersections became scary, accidents and near accidents increased. Clearly the safety risk was heightened. Yet, the city not only fought to increase the number of red light cameras, but passed a law to add speed cameras. What was the motivation? It was money! The governor of that state vetoed the proposed legislation to protect his citizens from the special interest. For this reason, Baltimore is small potatoes compared to the cash being made by the District of Columbia. Their mayor not only insisted on more cameras in strategic locations but has included the revenue as part of his annual budget. The government and the private contractor have made $122 million dollars and counting. However, as bad as the red light scam is, the really big bucks are made on the speed traps. It is the speeding cameras that have the greatest potential for abuse. Cameras are installed in locations where revenues are maximized, and they are not ashamed to say so. In fact, the mayor of the District of Columbia actually insisted they have more speed cameras “to maintain and increase the revenue.” In his request he was open and honest about his purpose. There was no pretense of mentioning the issue of safety. Safety was not even an afterthought. It was all about the money. This government wrote the law to make you guilty until you could prove yourself innocent—then made it as difficult as possible for you to prove your innocence. They put the speed cameras on fast-moving thruways where the posted speed limits were 25 mph, knowing that the average speeds on those roadways might be 40 mph. The choice of where to install the cameras guaranteed customers (as the department of motor vehicles calls its victims). They even produced a video about the cash cow where the police chief actually says, “…we’re not hiding anything; we are open and honest about our objectives…” That is bold. The truth cannot be disputed. Even when some cities buy or rent the red light cameras from their special interest friends in the name of safety, one inescapable truth is that lengthening the yellow light is the least expensive, very effective and appropriate thing to do to promote safety. A House of Representative Report, equally as clear, asserts that the placement of the speed cameras on high-volume roadways where the traffic flow is necessarily faster than the posted limit is about money not safety. If they were concerned about safety, why don’t they leave the highways alone and put the cameras in school zones? It’s because average, law-abiding drivers do not speed in school zones. It seems these cameras are meant to get the average law-abiding drivers—because there are so many of them. Again, when they issue more tickets, they make more money. State and local governments could not make this kind of money letting cops stop the bad drivers; so they bought these machines to cook the books—so to speak. The results have been clear. The safety motive is a smoke screen to justify this new stream of revenue. This logic is misleading and operates like a tax. If you recognize the problem it’s time to fight back. The deck seems stacked against the law-abiding driver. We believe the laws in our country place the burden on the government to prove we have committed a violation. The underlying infractions speak of a human being observing an operator, running a red light or speeding. A ticket must then be personally served, in the hands of the driver, by the human police officer who alleges to have seen the violation. When the driver challenges the ticket, he can schedule a hearing or trial and confront his human accuser. The photo ticket scheme turns these rules upside down. First, the camera is the accuser. Second, a ticket does not have to be personally served in your hands; instead, a third party government clerk or even the private contractor who stands to make money on the tickets can merely mail it to your last known address. If the driver has moved, the burden is on the driver to prove the city was notified where to send this ticket if he/she ever got one. And, finally, even though the camera has taken the place of the human accuser, the driver doesn’t even get a chance to confront the camera. This means that generally, the government will not need to prove the camera was calibrated. It also means the government does not have to prove the photo it claims as evidence—that the camera “observed” the violation—has not been tampered with. This is called a requirement to “authenticate.” It is an established legal principle that before any scientific evidence can be introduced to support a prosecution, it must be authenticated. Authentication generally means the chain of custody of the evidence must be detailed and statements concerning the reliability of this type of evidence must be provided. Furthermore, governments with their big business partners use misleading public relations campaigns designed to distract the law-abiding citizen from the important legal attacks on traditional liberties so they can collect your money. These public relations campaigns cry that driving is a privilege not a right and that red light runners and speeders abuse that right. They tell you to be afraid of bad drivers and then proclaim the photo camera will stop those bad drivers in their tracks. No one is for bad drivers. 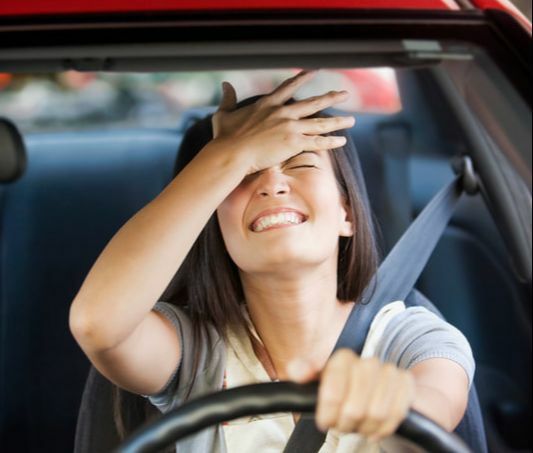 The inference is that if you get a ticket, you must be a bad driver and deserve to be punished; however, the punishment is not to protect others by suspending your driving privilege. Instead, they want you to keep driving so that you can pay money. Is that logical? They disregard the fact that many who receive these photo tickets have rarely, if ever, gotten a ticket and are generally law-abiding drivers. They want you to disregard the conclusion of The U.S. House of Representatives. They also expect you to disregard the studies in North Carolina, the City of Baltimore and Arlington, Virginia, as well as the comprehensive study known as “The Australian Study” that show an increase in rear-end collisions when these cameras are in use. They even expect you not to connect the dots between the District of Columbia making $122 million dollars and their placement of the cameras where traffic volume is high and the average speed is always above the posted limit. In other words, the government and its big business partners in the camera ticket scheme want law-abiding drivers to stop thinking. They want you to be afraid to fight the photo tickets. They want you to pay up. Are you going to pay up or fight back? You can expect[TJ2] to receive either a red light ticket or a speeding ticket. You must be prepared to fight both. They have tricks to collect your money as quickly as possible. Your defense or trick is that you know the objective of the game and you expect to keep your money. This is how you can effectively fight back. ALWAYS DENY OR PLEAD NOT GUILTY! Do not admit anything—ever. This protects your right to appeal if you lose. SEE ONLY THE PHOTOGRAPH! It is the evidence against you. It does not matter how grand or small the courtroom is. You must have tunnel-vision. Take your seat and look at the ticket and any supporting documents given to you. Even if they hold your trial in the Supreme Court of the United States of America, the only concern you will have is whether the photo makes the government’s case. This is no time to be concerned about your surroundings. Be concerned about the principle you are fighting to protect. HAVE FUN! They can’t put you in jail. SCHEDULE A HEARING – Simple, but often overlooked. The Government’s trick? Not Clear How to Schedule—make it as inconvenient a process as possible. Do not expect they will mail you a date until you ask for one. There may be a phone number, but often it will be hidden within the small print explaining how to pay. There may be a statement requiring you to come to a location or mail a request for a hearing date. In some states the ticket has your hearing date assigned if you choose to fight the ticket. Do not accept a statement over the phone that a date will be provided. Demand the date in writing. AND THE DAY BEFORE YOU GO, CONFIRM THAT DATE. Often the date will be changed; you won’t find out until you arrive and are so frustrated that you just pay. Don’t let this happen. DEMAND DISCOVERY – This is your first line of defense. It is procedural. If they don’t give it to you they should lose. You ask for three things: calibration, yellow light delay and studies. The Trick? They just don’t or won’t give it to you. Some actually write in their enabling law that no authentication is needed. This means they don’t have to prove the camera was working when it took your picture and they do not need to prove the photo has not been tampered with or incorrectly assigned to your car! Find out who you must ask for discovery and the format of your questions. Ask for proof of calibration of the camera within a year. Calibration is different from testing. It’s a test by an independent source confirming the equipment works properly on a given date. Testing is generally a self test where a button on the machine is pushed and it says the machine is operating. They will refer to the self test as if it were a calibration—but it’s not. If they can’t prove the camera was working properly you have a chance. Remember some jurisdictions DO NOT REQUIRE THAT THEY PROVE THE CAMERA OR THE RED LIGHT WAS WORKING. Ask for authentication information anyway! You will gain respect and the judge will have a tendency to listen to you. The reason is that generally accepted principles of legal fairness require that accuracy of the equipment must be authenticated before scientific evidence can be used to prove an infraction. If they are lawyers they would know this is not fair. You have gained an edge. Ask for information showing the length of the yellow light before the red light camera was placed and after the red light camera was placed. Federal law requires that the length of the yellow light be calculated to allow you time to stop safely, usually around four seconds. Some of these yellow lights have been reduced as low as 2.5 seconds. Unless you have the reflex of an Olympic athlete you can’t react quickly enough. Studies--Ask the date this red light camera was placed and the copy of any study performed justifying its placement at this location. It’s also a good idea to request the history of accidents at this location. If no known study was performed, or no justification—other than the potential for revenue—is identified, again your chances of winning are increased. LOOK FOR DEFECTS ON THE TICKET: illegible numbers and/or an unidentifiable issuing state, no direction of travel, incorrect date, photo does not match stated location’ there are more vehicles in the radar beam, or the ticket was issued more than thirty days after the photo was taken. Note: If the words are not consistent with the photo, if it says “Main Street” but this looks like “First Street,” this is a defect. LOOK FOR DEFECTS IN THE PHOTO: not legible and too dark to verify location. This is different from ticket defects. The issue is legibility, not mistake. If they can’t read your tags or verify your location, it is a defect. THE DILEMMA ZONE DEFENSE. : yellow too short., no crosswalk, no stop-line. If you ask, they must tell you the length of the yellow light! If it has been shortened, you win. Often there’s a box full of numbers on the photo. It purports to state the length of the yellow light. Do not trust it! Demand the log showing the engineer’s indication of the length of the yellow. General rule: If the yellow is less than four seconds you should win. It varies given the dynamics of the given intersection but this is a simple way to approach this issue. This is the trick that caused the U.S. Congress to criticize these tickets for cash scams. Judges are very sensitive to this concern and are likely to dismiss a ticket when the yellow light delay is too short. If you cannot see the lines for the crosswalk or a stop line then usually you win. Why? The standard of review in most jurisdictions for the red light violation is: what color was the light when you actually entered the crosswalk, but if no crosswalk, then the stop line and if neither is present then the color when you enter the intersection. Furthermore, if you cannot see the lines then you can’t know the “Dilemma Zone.” In other words, you can’t be expected to know when you “cannot go” or “cannot stop”. GET READY TO APPEAL. Finally, if you are not winning, build a record for appeal. Ask if there have been an increase in accidents since the red light cameras were placed. Ask if they know about the Australian study that concluded that red light cameras tend to cause rear-end accidents! (See p. 18 of House Report). Ask if your city or state has the studies. Ask if they know about the Montgomery County, Maryland, police chief who ran a red light and caused an accident where the yellow was shortened. Ask them if they are familiar with the five-car rear-end pile up in Arlington, Virginia on July 12, 2000 where the cause was determined to be a “fast changing yellow light.” (p. 36, Red light camera timeline). Unless your jurisdiction has increased the cost of these red light tickets to $300, as counties in California did, most drivers do not appeal. The cost and time does not seem worth it when the tickets are “only” $75. But remember you are one of the thousands and someone has to fight back. These cities hope you will not fight the tickets so they can keep taking in the money. Look, you have nothing to lose. Take full advantage of your day in court on this red light ticket and—if the spirit moves you—appeal if you lose. If you have raised the issues listed, your chance of winning on appeal is good and you’ve got a fighting chance. The red light directions also apply for these speeding tickets. Demand Discovery. Look for defects, however, there are special tricks used to take your money with speeding tickets. The most important is the failure to use “engineering” (often called “speed surveys” as required by federal law (23 CFR section 655, subpart F). This is the national standard for all traffic control devices on all public roads in accordance with 23 U.S.C. 109(d) and 402(a). There will be some duplication to reinforce the actions you must take. (d) SERVED THE TICKET BY MAIL. (e) AN ENGINEERING OR SPEED SURVEY IS REQUIRED TO ESTABLISH THAT THE POSTED SPEED IS LEGALLY ENFORCEABLE. DO NOT FORGET. DO IT IMMEDIATELY. THERE IS A TIME AFTER WHICH YOU LOSE YOUR RIGHT TO A HEARING. Usually, that time is thirty days. Some jurisdictions allow sixty days. Once your time is up, your chance to fight back is lost. You can submit a motion for a hearing, but there are complications and you are NOT likely to win—(remember this is not about fairness or due process, it is about money. Once they have your money why expect fair play?). TRICK? Remember, they will make scheduling inconvenient. Sometimes you cannot see the fine print detailing the phone number, addresses or other details concerning the instructions for requesting a hearing. Often the place will have no available public parking or the available times will be calculated for maximum interference with your work day. Do not be stopped. DEMAND DISCOVERY. In addition to calibration, you must request any and all engineering surveys. The “MANUAL ON UNIFORM TRAFFIC CONTROL DEVICES” produced by the U.S. Department of Transportation (Federal Highway Administration) requires all jurisdictions to perform a speed survey to determine the average speed on a roadway before speed signs can be posted. If the state or city fails to comply, they lose federal funding. The purpose is to prevent speed traps. When a speed limit is to be posted, it should be the 85th percentile speed of free-flowing traffic, rounded up to the nearest 5 mph increment. The trick? If the survey indicates that the 85th percentile is 40 mph they will round down instead of rounding up 5 mph as required. These surveys differ in form but must be certified as performed by engineers and have the same basic substance. For example they must state the existing posted speed, state the 85th percentile (a pace range)—what the 85th percentile speed rounded up by 5 mph equals (e.g. 39 + 5 mph = 44 mph)—show an accident record review, show the geometry of the roadway (e.g., length of roadway, presence of sidewalks, curves, etc. ), traffic volume, unusual conditions, radar enforcement speed, and roadway rype (e.g., major artery vs. residential). If they give you the survey, look for the information. But if that is too complicated, just remember: it is 85 percent of the average speed plus 5 mph. Then ask what the posted speed was at your location when you received the ticket. If it’s less than the federal standard you should win. If they round down instead of up, you win. If they admit that this is a speed trap but insist that even if the posted speed were illegal by federal standards, your speed exceeded even that standard, you should still win. You should only be found guilty of the speed charged. But remember, this is about money. They may charge you with “unreasonable speed,” which is not specific. This provides the government flexibility to get you anyway. If it happens, appeal. Continue the fight—because you are right and they are greedy. CHECK TICKET FOR DEFECTS: two (2) cars in the beam, wrong tag number, no direction of travel stated, location of incident not correct. DEFECTS, DEFECTS, DEFECTS. If two or more cars are in the camera beam, you win. If your car has not been accurately identified, you win. In other words, they did not put the right tag number on the notice they sent you (this is different from “the car in the photo is not your car”). If the location is spelled incorrectly (using “Penn” instead of “PA” for Pennsylvania or just plain misspelling a street). These defects` could cause what is considered an “opportunity for confusion” concerning the location and can be a basis for dismissal. The point is that “Procedural Due Process” is generally our right. The basic elements of this principle are that the city must identify you and must tell you what you allegedly did and where you did it. If the ticket doesn’t do this it is materially defective and you can request a dismissal. 3. DEFECTS IN THE PHOTO: tag not legible, car not visible, location too dark, and marking on the roadway not legible. Remember, TRUST YOUR INSTINCTS. Anything that seems important but you cannot make out clearly in the photo creates a material defect. First, look at the photo. If it is at night and you cannot see the color of the vehicle, any identifying roadway markings, or street signs, then you can win. If the tag is not clear you will win. 4. PREPARE TO APPEAL. There are several ways to appeal the speed tickets. First, the Engineering/Speed Survey issue is always solid. The jurisdictions are not complying with federal laws. Second, since photos cannot “show” speed they have no special reliability. Without a person to confirm/authenticate that the camera and the Gatso-meter were properly calibrated, there is always doubt. Since the burden of proof tends to require that the government’s case be “clear and convincing” you have a good chance. If you need a lawyer call one. If you can’t find one, call us at PhantomALERT and we will guide you. Although the government’s alleged justification for photo enforcement programs rely upon politically-correct slogans about automobile safety, the actual methodology for placing the photo enforcement cameras throughout your city has little to do with safety and much more to do with generating profits for the city and its contractors. This methodology for identifying where to place the cameras involves a strategy of calculating the volume of traffic at particular sites so they can determine how to offset the cost of the program. They do not mention safety for two reasons. First, the studies show accidents have increased at intersections where the red light cameras are placed and second, safety is not, and never was, the motivation. It has always been about the money. You know this in your heart. The studies in this book have confirmed your suspicions. Now you have the facts for debate. Now you have the comfort of knowing that U.S. Congressmen and Australian Legislators agree these photo camera programs are little more than “tickets for cash” schemes that have resulted in a cash cow windfall for local governments. They have disregarded federal rules against creating and cashing in on speed traps. The big business interests, with the help of local governments, are moving to spread this plague as quickly as possible. States such as Texas and New York want to cash in, as do states such as the District of Columbia and California, before the law-abiding drivers stand up to stop them. It’s up to you to take action. You are armed. You must FIGHT BACK! 1. Engineering countermeasures are a much more effective and economical solution to reduce red light related collisions. • Most red light running is unintentional and caused by yellow light times that are too short or other engineering deficiencies. •Yellow light times in Los Angeles are currently based on the posted speed limit but should be based on the actual speed of traffic approaching the intersection. Lengthening the yellow signal to the proper time will reduce violations and collisions as much as 50 percent or more. • Lengthening the all-red phase prevents accidents by making sure the intersection is clear before cross traffic is released. Some major intersections in Los Angeles have all-red times less than half a second, and need to be closer to two to 2.5 seconds. • The most severe accidents are caused by impairment, distraction and fatigue, which the red light cameras can’t prevent. •If the city improved the signal timing and fixed any other engineering deficiencies, accidents and violations would drop and there would be no need for photo enforcement. They are spending your money and giving out tens of thousands of tickets for no reason. 2. The cameras have not improved safety and may have made us less safe. • Contrary to LAPD claims, any improvement in accident statistics is a result of state-mandated longer yellow times being implemented when the cameras were installed. The second reason for improvement in statistics is a decrease in traffic volume. • At some intersections, red light related accidents disappeared long before the cameras were put in, but the LAPD claims the cameras caused the reduction in accidents. • Red light cameras can’t reduce the most serious accidents because those are caused by impairment, distraction and fatigue and occur well after the light has turned red. Red light cameras, if they have any effect at all, only have the possibility of affecting the relatively few drivers who try to “beat the light” and misjudge by a few tenths of a second. In these situations, a sufficient all-red phase will prevent collisions from occurring. 3. The city loses over one million in taxpayer dollars on the program every year. • This is likely to get worse as cited drivers begin to realize that if they ignore their tickets they won’t be reported to the DMV. • Also, appeals’ courts in many counties have ruled red light camera evidence to be inadmissible hearsay. It’s only a matter of time before the appeal’s court in Los Angeles rules similarly. 4. The program is being subsidized by giving out tens of thousands of citations for rolling right turns which rarely cause accidents. • At some intersection approaches, rolling-right-turn tickets make up as much as ninety-seven percent of the citations. • Rolling right turns pose little danger and don’t warrant spending millions of dollars to prevent this behavior. The average number of rolling-right-turn collisions each year was 45 out of an average of approximately 56,000 collisions annually in the City of Los Angeles., which represents just 0.079% of all accidents. About three times as many accidents are caused each year by drivers opening their car door into passing traffic. •The majority of rolling-right-turn collisions resulted in minimal or no injuries, even when pedestrians or bicyclists were involved. There were no fatalities noted due to rolling-right-turns between 2002 and 2009. • The chance that a rolling-right-turn will result in a collision is 0.00029%. This means that a driver would have to make over 345,345 rolling-right-turns before they might be involved in an accident. Drivers who make slow, cautious rolling-right-turns will likely never cause an accident. 5. The cost of the red light cameras goes far beyond the million of taxpayer dollars wasted every year. • The millions of dollars spent in unnecessary fines and higher insurance rates are unavailable to be spent on local goods and services to grow our economy. If you own a business in Los Angeles your customers have less money to spend because of the red light camera program. • Needless ticketing clogs our courts and makes our justice system less available for necessary cases. The Los Angeles Superior Court, where these cases are adjudicated, is facing a backlog of almost a full year. • Unreasonable and unfair enforcement of traffic laws engenders disrespect towards our public officials and the police. Citizens are much more likely to see law enforcement as an adversary rather than an ally which makes it more difficult for the LAPD to obtain the public’s help with more serious crimes and safety matters. At a time when the City of Los Angeles is slashing essential government services and laying off workers, the Photo Red light Program is an inexcusable waste of city and law enforcement resources. Drivers who fought back and won. Motorist learns the value of contesting all citations as Washington, DC admitted accuracy of photo radar ticket was doubtful. Doubt over the accuracy of the speed camera equipment led to the dismissal of a Washington, DC photo radar ticket last month. On May 7 a 34-year-old engineer from Alexandria, Virginia had been driving on Interstate 295/395 near 9th Street on a sunny morning when a mobile speed camera operated by American Traffic Solutions snapped a photo of the engineer's car. The camera claimed that the Audi was traveling at 51 mps—11 mph over the District's 40 mph interstate speed limit. The motorist, who requested anonymity, decided to fight the citation out of "spite." He arrived at the District's Department of Motor Vehicles on August 17 unprepared with an argument that would beat the ticket. He fully expected to lose, but thought it was right to "cost the city more money" because he saw the photo radar program as little more than an illegitimate money grab. The motorist was surprised, however, when Adjudicator Stephen Reichert took one look at the ticket photo and noted that a second vehicle had been within the radar's field of view. Radar guidelines suggest this situation could cause a spurious radar reading, especially since the District's contractor provided no video or other secondary verification of speed. View full-size photo. "In as much as the government-submitted photograph shows multiple vehicles traveling through the radar zone in a receding direction, the government has failed to prove by clear and convincing evidence that respondent's vehicle was identified as the vehicle speeding," Reichert wrote. "Thus the ticket is dismissed." The motorist was glad he did not need to give the speech against the system that he had planned to give. "I said 'no' when asked if I had anything else to add, and out I went with my cash remaining in my pocket," the motorist told The Newspaper[TJ3] . "Cost to me: $3.30 in metro fares. Win." As of last month, the District's private photo enforcement contractors mailed a total of 4,019,023 tickets worth a total of $305 million. That is equivalent to one ticket not just for every resident of Washington, DC, but for every single resident of the District plus surrounding Virginia and Maryland suburbs. A copy of the adjudicator's decision is available in a 250k PDF file at the source link below. Will Foreman has beaten the speed cameras. Five times and counting before three different judges, the Prince George’s County business owner has used a computer and a calculation to cast reasonable doubt on the reliability of the soulless traffic enforcers. After a judge threw out two of his tickets Wednesday, Mr. Foreman said he is confident he has exposed systemic inaccuracies in the systems that generate millions of dollars a year for town, city and county governments. He wasn’t the only one to employ the defense Wednesday. Two other men were found not guilty of speeding offenses before a Hyattsville District judge during the same court session using the same technique. “You’ve produced an elegant defense and I’m sufficiently doubtful,” Judge Mark T. O’Brien said to William Adams, after hearing evidence that his Subaru was traveling below the 35-mph limit - and not 50 mph as the ticket indicated. Mr. Foreman, the owner of Eastover Auto Supply in Oxon Hill, examined dozens of citation photos of his company’s trucks that were issued along a camera-monitored stretch of Indian Head Highway his employees frequently travel. The camera company, Optotraffic, uses a sensor that detects any vehicle exceeding the speed limit by or more miles per hour, then takes two photos of it for identification purposes. The photos are mailed to violators, along with a forty dollar ticket. For each ticket, Mr. Foreman digitally superimposed the two photos - taken 0.363 seconds apart from a stationary point, according to an Optotraffic time stamp—creating a single photo with two images of the vehicle. Using the vehicle’s length as a frame of reference, Mr. Foreman then measured its distance traveled in the elapsed time, allowing him to calculate the vehicle’s speed. In every case, he said, the vehicle was not traveling fast enough to get a ticket. So far the judges have agreed. Speed cameras “can be good, but not if they’re abused,” he said after the hearing. The Maryland General Assembly approved speed cameras in 2009 for school and highway-work zones, two years after a pilot program in Montgomery County. Prince George’s officials have long resisted speed cameras, but many municipalities began implementing them in fall 2009. Supporters of the devices have argued they reduce speeding over time and increase safety, while many opponents call them a cash cow for local governments. Mr. Foreman’s tickets were issued in Forest Heights, a town of about 2,600 where officials expected $2.9 million in ticket revenue this fiscal year, about half the town’s $5.8 million budget. In Prince George’s County, cameras are operated entirely by municipalities, which can set them up within half-mile school zones. The devices are installed by vendors that typically receive about 40 percent of the payout on each ticket, with the rest going to local, county and state government. Municipalities other than Forest Heights also use Optotraffic cameras. The Lanham-based vendor also serves New Carrollton, Mount Rainier and College Park, as well as the city of Cambridge in Dorchester County, Maryland. Optotraffic representatives said the photos are not intended to capture the actual act of speeding, and are taken nearly 50 feet down the road from sensors as a way to prove the vehicle was on the road. An Optotraffic technician was sworn in and offered the company’s defense in the courtroom on Wednesday to no avail. Mr. Foreman didn’t buy it either. He said it was unlikely that his vehicles slowed significantly after passing the sensors, as photos typically show them with their brake lights off. While Judge O’Brien let Mr. Foreman off the hook, he ruled against several other accused speeders who based their not-guilty pleas largely on gut feelings that the cameras were flawed, while reducing the fines for some who pleaded guilty. How Did Will Foreman Prove His Innocence? First, Forest Height's speed cameras are a proprietary design by Optotraffic, a division of Sigma Space Corporation. These cameras are neither radar (like most cameras used in Montgomery County) nor are they exactly like traditional police LIDAR. Technical specifications for Optotraffic's cameras can be viewed here. To simplify it, Optotraffic's cameras work by taking two laser sensors into each lane of traffic. The device "records the time when each sensor detected the object." The speed is then calculated as "Measured Speed = Distance/Time." If a vehicle is determined to be exceeding a predefined threshold speed, a short distance/period of time later the device snaps two photos a fraction of a second apart. So why would someone think the devices are inaccurate? Well, because many people have gotten tickets from Forest Heights for speeds they know they were not traveling at. Some of them performed their own distance/time calculations from the citation images which produced an extremely different speed than what they were cited for. Speed camera images are typically taken a few tenths of a second apart, so the distances traveled are fairly short (tens of feet). Getting exact distances from photos can be difficult, so it is hard to convincingly prove the speed measurement was in error unless it was off by a large amount. If the speed camera was off by say 5 mph then proving yourself innocent this way would be difficult (and proving yourself innocent is exactly what you would be required to do in court). Assuming large errors are sporadic (as opposed to a device that always produced an incorrect result), any one specific person would be unlikely to get enough citations with extremely large errors to prove the existence of a pattern. A local business owner, Will Foreman of Eastover Auto Supply in Oxon Hill, maintains a small fleet of vehicles that must drive up and down Indian Head Highway in Forest Heights several times per day and as a result received a large number of citations for that fleet. He later discovered other enraged citizens had also received questionable tickets. Many of the photos clearly show the speed measurements are much higher than the distances traveled between the citation images. The citation images below were all found to have a photo interval of 0.363 seconds between frames according to the timestamps on the images. Our first citation stated the vehicle was traveling at 56 mph. The length of this pickup is about 16 feet, meaning the truck should have traveled 1.82 truck-lengths (or one length, plus another 13.18 feet) to move at this speed. We've added guidelines to compare the image, showing that the distance is one length, plus the gap between the front and back of the two truck images. That gap is much less than half a truck-length. We estimate this to be less than four feet based on the size of the wheel-wells. That would work out to a total distance of less than 20 feet, which given the interval of 0.363s would be just under 38 mph. This indicates an error of 18 mph, and a speed 9 mph below the threshold for issuing speed camera tickets under state law (47 mph in this case). Our second example is even more obvious. This truck was measured by the device to be traveling 65 mph on July 28, 2010. As such should have traveled 34.6 feet, which given this vehicle's length of no more than 16 feet it should have traveled at least 2.1 truck-lengths. Superimposing those two images, you can see that this distance is not even close that distance. It would seem that even driving 5 mph below the speed limit might not get you past these speed cameras without a fine. Another example, which took place on September 9, 2010, showed a van clocked at 51 mph and therefore should have traveled 27.15 feet between images. This van is about 17 feet long so it should have traveled 10 feet longer than one length based on the recorded speed. As you can see, the front of the first superimposed van image is almost aligned with the back of the second van image. The van couldn't have traveled more than one or two feet more than one van-length, placing its speed right around 35 mph a difference of close to 16 mph compared to the recorded speed. Opt traffic told The Washington Post that the company's cameras "accurately measure vehicle speed within .5 mph below speeds of 55 miles per hour." Well if they said that it must be true, right? But the most compelling image is this one, dated July 22, 2010, showing both an Auto Value truck and a Metro bus. The citation charged this pickup truck with traveling 76 mph. The 0.363 photo-interval means the vehicle should have traveled 40.46 feet which is more than 2.5 truck-lengths. The superimposed images clearly show the actual distance to be a little more than one truck length, less than 20 feet total—not even half the distance it should have traveled at 76 mph. (We note that the bus in the right lane traveled a bit over half its length, and this would also have been well under 40.46 feet. So while one could consider whether this one was possibly a matter of incorrect lane assignment, even if that were the case the bus was also traveling much less than 76 mph.) Mr. Foreman hung this last photo in his shop for some time to protest what he called the "Indian Head Highway Robbery." We have received many other examples of this from other drivers in the area. The amount of the discrepancy varied from case to case but one thing is clear: the speed cameras in Forest Heights are not consistently producing accurate speed measurements. While the majority of documented cases occurred in the summer of 2010, some questionable photos were dated in December, meaning that whatever issue caused these errors it is likely still there. Mr. Foreman's business was adversely affected by what they now refer to as the Forest Heights Toll Plaza. When the tickets first started to arrive he took the matter up with his employees and warned them about speeding, holding them responsible for paying the tickets. However even though the drivers all knew about the camera locations, the tickets kept coming. When he learned that the vehicles had in fact not been traveling the speeds they were cited for he realized he had been disciplining employees for something which was beyond their control. That is not a good position for an employer to find himself in. Some members of his staff who need to do deliveries now drive far out of their way to avoid the "Forest Heights Toll Plaza" even though this costs the business time and money. Similar cameras are used in many other municipalities in Prince George's County, including College Park, Riverdale Park, New Carrollton, Berwynn Heights, and Mount Rainier. There have been specific reports of errors from these cameras documented in Brentwood, Riverdale Park, and Cheverly. When a similar situation was investigated in Cheverly, the response from the company was that the vehicles had simply decelerated between the time the speed measurement was taken and the time the photos were taken. There are three problems with this. First, in the above photos, the vehicles do not appear to have their brake lights on. Second, the vehicles simply did not have enough time. A typical deceleration rate for a car or light truck is around 25 feet per second per second. Looking at our last example, decelerating from 76 mph (111 fps) to 35 mph (51fps) would take 2.4 seconds. The vehicle would have traveled about 194 feet, or twelve truck lengths, in that amount of time. The actual distance between the camera and the photo position is only a small fraction of that distance. 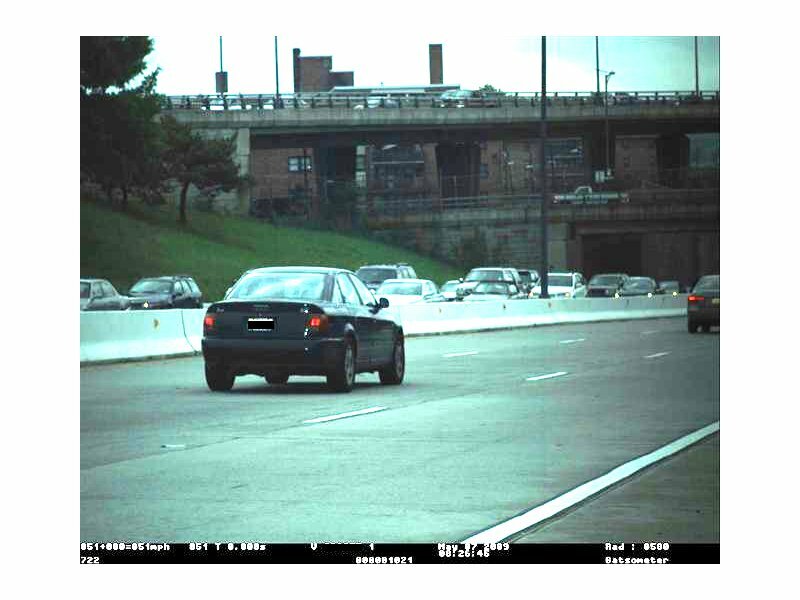 Lastly, Optotraffic's own documents state that citation images can be used for speed verification: "While the primary evidence for issuing a speeding citation is the calibrated Lane Sensor, the two photos provide the secondary evidence of speeding that is presented to the citation recipient. Since a stationary object is present along with the vehicle, a photographic method also determines speed, guaranteeing fairness." But wait a minute, the machines are tested for accuracy: Doesn't that mean they cannot possibly be wrong? According to the system spec of the similar Optotraffic cameras used in Brentwood: "Each Lane Sensor is third-party calibrated annually (by Maryland law) to verify the beam distance; in addition, the relative time between the sensors is calibrated daily using the 1 pulse-per-second (PPS) signals from the Global Positioning System (GPS) satellites" That sounds very impressive, but notice this only means they have calibrated the system's components. The spec does not state whether the device is actually tested as a complete system under real world conditions. Whatever actual (unspecified) speed testing did take place, it seems unlikely that it was tested with thousands of vehicles of different configurations, sizes, two vehicles passing at the same time, etc. under a variety of conditions and confirming that none of their speeds were incorrectly measured. So at best, the devices were tested for "accuracy" under "controlled conditions," but not for consistent accuracy under real world conditions. Just because a device works correctly sometimes under perfect conditions does not mean it works right every time under all conditions. Likewise, the device "has a test mode that runs daily to verify the basic functionality of the data processing unit and calibration of the Lane Sensor." A sample output is shown at right. If it is tested every day then it must be accurate, right? But wait a minute, how could an automatic test possibly be checking the accuracy of speed measurement against a real moving vehicle of known speed? Did they arrange for one to automatically drive past at precisely 35 mph the same time every day? Unlikely. The answer is that it is not. It is merely testing that it has a GPS signal and that various components are "working." The chart showing the "speed error" may seem very technical and is made to appear like meaningful testing is being presented as evidence in court, without an actual speed measurements on any vehicle being part of this self-test. Laboratory tests or component tests may be over-simplifying what happens in the real world, the way the teacher of a first year physics class would simplify a problem for his students with massless[TJ4] frictionless pulleys, and falling bodies in a perfect vacuum. In the real world, the device needs to take many variables into consideration. If the lasers do not use the same point on the vehicle for both measurements the device may not calculate a correct speed, regardless of how accurate the individual components are or how often they are tested. Did both laser-sensors strike the same point? Was this an unusually shaped vehicle like a truck, a motorcycle, or an RV pulling a trailer? Could the device's 32-foot telescoping pole start to sway or vibrate due to high winds or a passing truck, and would this effect the angle of the beams? Could something other than a vehicle interrupt a beam? And would any such problem be likely to present itself in a limited number of controlled tests? So who is investigating what is going on? Only the town of Forest Heights and its contractor, who each have a substantial financial stake in finding that there is no problem. DALY CITY, Calif. (KGO) -- A driver who was caught by one of those red light cameras in Daly City took the case to court, and the result might effect future cases. "The only sign they have is up here heading west," said Scott Conforti, who was nabbed by a camera in February at Pancetta and John Daly Blvd. Conforti hired lawyer Ellen Mendelson. She claims Daly City's contract with the camera maker Redflex violates the state vehicle code, specifically the regulation of these signs warning drivers there are red light cameras ahead. "The way the contract is written, Redflex is responsible for inspecting and maintaining it and that violates the law," Mendelson said. The law indeed states that the responsibility for the signs may not be contracted out to camera makers, that the city must inspect and maintain them. Last Friday, it went to trial. She says the commissioner agreed with her and dismissed the ticket. Mendelson says other Daly City ticketholders now have a legal reason to fight their cases. "Anybody who gets one of these tickets in Daly City from April 1 forward should be challenging the ticket vigorously, set the matter for trial, and challenge it based on the contract," she said. Not so fast says city attorney Rose Zimmerman. "The city followed all of the requisite steps necessary to assure we are in compliance and that Redflex is in compliance with us and we are not in violation in any way of the vehicle code," said Zimmerman. But the city's contract with the vendor says "Redflex shall be solely responsible for installing such signage," and for any fabrication, notices or other postings. "The way the contract is written, it is not a legal contract," Mendelson said. Zimmerman contends the commissioner dismissed the ticket on technical grounds related to evidence presented by Redflex and not because of contract issues. Either way, Conforti feels vindicated. "We're all supposed to be following the rules," Conforti said. "The guys making the money should have to follow the same rules same as the guys paying the money." Who's right? The lawyer or the city attorney? The commissioner declined to talk about the case, saying it might prejudice other cases coming before her. It may take another legal challenge by someone else to find out how this all plays out for others cited at that intersection in Daly City. Baltimore City Cameras Ticket ”Invisible” VehicleBaltimore City claims that police review each citation before it is mailed. However this review apparently does not extend to ensuring the car can actually be identified. One Maryland driver recently received a citation for a car that did not belong to him, for which the photos taken were so dark the vehicle could barely be seen. After contacting the phone number on the ticket (which is run by the camera contractor, ACS[TJ5] ), he was able to download the violation images from the website. and Then the next surprise; you cannot even see the car itself in the image. The nighttime photo was so dark only the tail lights, hub caps, and license plate were visible. The license plate number appeared to match his own, except that one letter (a W on his plate) is blurred beyond recognition and is actually an N or an M.
While the cited car itself can barely be seen, by brightening the image and zooming in it is possible to still compare the visible portions. Notice that the cited vehicle has a round tail light, whereas the photo of the recipient’s car (top) has triangular tail lights. The cited vehicle appears to be a four-door sedan whereas the recipient's car is a two-door coupe. You can also see the registration sticker on the upper left corner of the cited vehicle's plate is red; the ticket recipient's sticker is green. Another thing to note about the ticket was the timestamps; they were accurate to only one second. The timestamps jump from 18:57:31:00 to 18:57:32:00. Yet this could not possibly be correct, since in a full second the vehicle would have traveled several car-lengths at the cited speed of 49 mph. We recently did a story on how drivers in Forest Heights were able to use image timestamps to demonstrate speed measurement errors. Well with only one second of precision, when the real interval is likely in the range of 0.2-0.3 seconds but could in theory be anywhere from 0.01-0.99 seconds, proving oneself innocent by a time-distance calculation would be impossible! It appears some camera contractors "learn from their mistakes" and are now rounding off the image timestamps to the point where such verification is impossible. Having collected this information to challenge the ticket, he then proceeded to contact the city, which told him they would “put in a dispute” and that he needn't even worry about requesting a hearing. No problem? But then, just to be on the safe side, two days later he called them back to check. The person answering his call said they had nothing in their system about any dispute and didn't even have a record he had called previously. It appears the mantra for dealing with Baltimore City is "Trust But Verify." Baltimore's review of photo citations has come up as an issue before. Not long ago it was reported that the signature of a deceased Baltimore police officer appeared on approximately 2000 red light camera citations after he passed away. In early 2010, Baltimore issued nine hundred thirty-two tickets in error after a camera was configured to the wrong speed limit. LONGVIEW, Wash. – There are 303 drivers breathing a sigh of relief in Longview. Tickets those drivers got at red light and speed cameras are being dismissed because of a computer glitch. A city spokeswoman said the tickets were printed with the wrong city listed. Lynnwood is 144 miles north on Interstate 5, north of Seattle. City spokeswoman Susie Meyers said the glitch happened when contractor American Traffic Systems printed the tickets. Anyone who already paid their ticket will be given a refund. People who have not will get a notice in the mail saying their ticket has been dismissed. The wrong tickets were all issued between February 14 and March 8 at red lights and in school zones. An Arizona Entrepreneur Attempts To Defeat Photo Radar With Passive Resistance. A Tempe, Arizona entrepreneur last week announced an experimental method for defeating photo enforcement in his area. Sean Tierney, 31, CEO of Jumpbox Inc., ordered a personalized plate for his gray Chevrolet Tahoe that reads, "0DOO0D0." This combination of characters similar in their appearance often confuses automated optical character recognition software. "But much like The Club causes enough of a nuisance to deter the would-be thief, this technique should cause the would-be photo examiner to pass over your ticket," Tierney explained, urging others to adopt the technique. "The more people that have plates with permutations of 0's and O's and D's, the more difficult their task becomes." Tierney calculates that 2187 combinations of the hard-to-read characters are possible on the custom plates that are only $25 in Arizona. Many of the alternative methods to avoid tickets he considered were either illegal or ineffective. For example, a radar jamming device, even if it worked as advertised, would not influence the Scottsdale system that relies on in-ground speed sensors. Scottsdale's automated ticketing machines will resume operations early next year. "I hate photo radar," Tierney wrote. "And it's not because occasionally I drive too fast and get a ticket. It's because the city proselytizes it as being a safety measure when in truth they're using it purely as a revenue-generating tool." A Bethesda woman escaped her speed camera ticket after she uncovered maintenance problems with Gaithersburg's cameras. Peggy Lucero was nabbed by a speed camera in a 30 mph zone on Route 355 in Gaithersburg. Instead of paying the $40 fee like most Maryland motorists, Lucero dug up records on camera maintenance and asked the State Highway Administration to validate the area's speed limit. "I devoted five months of my life to unearthing the contradictory and circuitous path of trying to find justice in this mess," Lucero said. Maryland law requires police to test speed cameras for proper functioning daily. But Lucero discovered the camera that ticketed her wasn't tested the day it photographed her license plate. Officials failed to perform daily tests on a second camera down the road, as well, records revealed. A police officer tested the second camera on Dec. 18, 2009, and did not return for the next checkup until Dec. 28. Records also showed two-day and four-day gaps between tests in December 2009 and January 2010. State highway officials responding to Lucero's request for a speed study discovered the Gaithersburg stretch of the road had not been assessed for an appropriate speed in five years. Highway officials concluded the limit lagged by ten miles per hour. State highway traffic engineer Andrew Bossi recommended Gaithersburg increase the speed limit and warned that the 30 mph zone posed a danger to drivers. "Motorists would brake significantly at each camera location, ```followed by accelerating immediately afterwards," Bossi wrote to city officials in a March 3 e-mail. "The current conditions may pose a more significant risk for rear-end and sideswipe conditions." "At the [March 22, 2010] meeting our Mayor and City Council were unanimous in the desire to not raise the 30 mph speed limit in this area," city Public Works' Engineering Services Director Ollie K. Mumpower wrote. In fact, the city wants to extend the speed limit a half mile down the road, where it increases to 35 mph.. Either way, Lucero's off the hook. She brought the camera logs and speed study to court, and the judge promptly tossed her ticket. Recently, an 89-year old Carter County man received a ticket from a red light camera in Kingsport. That may not sound like news, but the ticket that Ray Tolley got in the mail, clearly shows some discrepancies. Tolley has a 1990 Ford pick-up, not a white Mustang, and the numbers on the license plates are off by one number. Now, Tolley's son David is trying to get the ticket mix-up resolved, before it can tarnish his overall good driving record. "I will get a hold of them, and try to get this straightened out, 'cause Daddy don't drive a whole lot, but he needs ever now and then, to go maybe to Hampton, or something to pick up a little something, and I'm not around to get him. I don't want anything to go on his record,”, said David Tolley. While 11Connects[TJ6] were at the Tolley home, David was able to contact the Kingsport Police Department by telephone. The officer told him to fill out one of the forms that came with the ticket, and that should resolve the matter. Kingsport Deputy Chief of Police David Quillen said that over forty-thousand red light camera citations have been sent out, and only a handful had been sent out mistakenly. Quillen said that when mistakes are made on the red light tickets, they are usually resolved quickly. Overly quick red light camera trigger in Philadelphia, Pennsylvania results in 4390 refunded citations worth $439,000. A total of 4390 red light camera tickets, worth $439,000, will be refunded in Philadelphia, Pennsylvania after a ticket challenge revealed that they were improperly issued. The Philadelphia Inquirer newspaper uncovered the error while investigating the case of Mike Kochkodin, 59, who received a ticket on March 17 for allegedly entering an intersection two-tenths of a second after the light turned red. Last month, a Philadelphia Parking Authority (PPA) adjudicator summarily dismissed Kochkodin's case, noting the city had promised not to take photos until a third of a second had elapsed. After an article appeared on Thursday, PPA decided to refund the tickets. "We did not know the magnitude of the problem, nor did the contractor report it," PPA Executive Director Vince Fenerty told the Inquirer. "Should we have looked further? Most definitely. We didn't." Fenerty suggested the error was caused by the February switch from cameras that use 35 millimeter film to fully digital camera technology. The contractor, American Traffic Solutions (ATS), is accustomed to using the quicker trigger setting to maximize the number of tickets issued and was unaware of the 0.33 second requirement. Shorter trigger settings or "grace periods" allow jurisdictions to collect more revenue because the greatest number of technical violations occur within the first 0.25 seconds after a light turns red, according to a Texas Transportation Institute study. Ticketing such violations has little impact on safety as the same study showed the probability of a right-angle collision within a split-second after a signal changes from yellow to red is almost zero at an intersection with a protected left turn lane. "Given a 1.0-second all-red interval, the probabilities also suggest that crossing through vehicles will not start to enter until after about 4 seconds have lapsed," the Texas study explained (page 99). Philadelphia also seems unaware of its own ordinance, which bans the use of digital technology. "Photographs collected as part of the automated red light enforcement system must be 35 millimeter film only, must only record traffic violations and may not be used for any other surveillance purposes," Philadelphia Code 12-3012 states. The provision was initially authored by state lawmakers as a means of ensuring the lucrative contract landed with campaign donor Affiliated Computer Services (ACS). Once the provision was publicized, however, PPA selected a less controversial vendor. Between April 1, 2007 and March 31, 2008, the system issued 89,156 tickets worth $8,915,600 at just ten intersections. Of this amount, ATS took $2,835,952, while ACS took $134,232 for collection services. Bowie attorney James Liskow says he always fights his speeding tickets, and this one was a no-brainer. He was snapped going 45 mph in a 30 mph zone on Georgia Avenue just south of Viers Mill Road in Montgomery County, Maryland last December. Liskow's challenge was based on the part of the speed camera law in Montgomery County that deals with evidence at trial. Liskow's argument was based on the fact that what he received in the mail dealt with a wrong section of the law. The citation he received in the mail was supposed to include the offending photo, vehicle registration number, and date and time of the violation, which it did. But it also referred to a section of the law that states that the citation is to include the county plan describing the proposed location of the speed monitoring system, published notice of the speed camera's location and a signed certificate attesting the camera passed its annual calibration check. None of that information appeared on the citation Liskow received in the mail. He appealed, the ticket was tossed. It's unclear how this will affect other cases. The Maryland Daily Record reports that the five-year-old statute could be easily tweaked in legislation that allows lawmakers to correct errors and omissions in state laws. In Riverside, California a red light camera trap was set up on August 5 at the intersection of Indiana Avenue and Van Buren Boulevard. Officials installed a "no right turn on red" sign without authorization at the location where a camera issues tickets for right-hand turns. The public works manager told the Riverside Press-Enterprise newspaper that this was a mistake and no tickets for violating the sign would be issued. The error was reportedly corrected on Tuesday. Red light cameras have returned to Virginia, and Newport News kicked off its automated ticketing program by falsely accusing hundreds of innocent motorists of running red lights. The automated ticketing machine at Oyster Point Boulevard and Jefferson Avenue malfunctioned and bogus warning letters were sent out after the camera went live July 31. Officials blamed “wiring problems”, according to the Newport News Daily Press. Bogus citations are nothing new in the Old Dominion (Virginia). Salem resident Bob Archer owns a light green 1998 Volkswagen Beetle with the license plate BUG IN, but he continually receives red light camera and parking tickets from 240 miles away in Arlington, Virginia and Washington, DC. Archer's car has never been that far north. The Roanoke Times reported that the District sent the first ticket in May 2000. The photograph on the ticket showed a dark Beetle with the plate BUG 1N—with the numeral one appearing where the letter 'I' is found on his plate. Neither the private vendor in charge of the program nor the city had any interest in clearing up their mistake. They just wanted him to pay up. He was forced to hire an attorney to prove his innocence. A speed camera in Milwaukie, Oregon demanded that 65-year-old motorist Glenn Nickelson hand over $288 for allegedly speeding in February, The Oregonian reported. Nickelson lives in Vancouver and has not stepped foot in Milwaukie for several years. Although Nickelson drives a Kia, the vehicle in the photograph is clearly a Pontiac. Despite claims that every ticket is reviewed three times by a human being, no one bothered checking the accuracy of the information on the ticket itself. In Arnold, Missouri a man attending his sister's funeral on August 6 was mailed a $94.50 ticket for driving in a funeral procession that legally went through a red light, KSDK-TV reported. Arnold police ignored Michael Daniels, who called to have the citation canceled. Officials relented only after the local news became involved. In Toulouse, France someone changed the speed limit signs on a highway from 90 km/h (55 mph) to 110km/h (68 mph), directly in front of a speed camera that ticketed people for exceeding 90km/h. After the change was discovered, officials were forced to refund the tickets issued, AP reported. Use PhantomALERT on your GPS or smart phone. See them before they see you. Agency – Government organization authorized to enforce or implement a given law. They promulgate rules and regulations designed to interpret what the law means and how it is enforced (e.g. Department of Motor Vehicles, Department of Transportation). Answer – Legal. To deny, plead not guilty, or otherwise respond to an alleged complaint, infraction, or violation. Appeal – Legal. A plea, request or prayer for the review and reversal of a decision believed to be unfair, unjust, or otherwise wrong. Authenticate – Legal. Concerns the use of scientific data as evidence. It is to confirm, corroborate, justify, validate, or verify the accuracy and relative reliability of the data as proof of the claim asserted (e.g. the camera was calibrated by a reliable, disinterested party, therefore the photos are more likely than not to accurately reflect the violation claimed). Automated Traffic Enforcement (“ATE”) – Traffic enforcement by machines, not by humans. As in “automaton” e.g. robotic, perfunctory, and mechanical. Humans adjudicate the tickets, but machines take the photo, print the tickets, issue the ticket, accept the response, prepare the prosecution evidence, collect the fines, and process other consequences—such as suspensions for non-payment. It is efficient with limited human input. Originally developed in the late 1940’s by a Dutch race car driver named Maurice Gatsonides. His device was called a “Gatsometer”. Used to enforce red light and speeding violations. Beam (radar) – A five-foot wide K-band radar beam using Doppler radar is projected at a 20 degree angle across a road. When a Gatsometer detects a car in the beam speeding, it instructs the camera to take a photo. Burden of Proof – The standard for review of the claimed violation. These specific elements must be demonstrated by one of three standards. Preponderance -- The lowest burden is used by parking tickets where the risk is only financial, and a right or privilege—other than keeping your money—is generally not in jeopardy. Clear and Convincing is the standard for most moving violations. This is because your privilege to drive is at risk. The photo radar tickets tend to operate under the burden of this proof standard. Beyond Reasonable Doubt is the highest burden and is used for criminal activity. Calibration – The act of testing the accuracy of scientific equipment, by a disinterested, independent source, for the purpose of confirming the reliability of the evidence or information proffered. Camera Ticket – The Notice of Infraction issued as the result of Gasometer triggered photo radar, photograph of an alleged traffic violation. Code of Federal Regulations (CFR) – Regulations promulgated by federal agencies to interpret the Federal laws or the U.S. Code. (e.g. Title 24 of the CFR section 655 was written by the U.S. Department of Transportation to interpret Federal Highway Administration legislation). Due Process (Procedural) – That process which is due in order to protect a right or privilege stated in the Constitution of the U.S. and expanded by many state and local laws. Typically, the process includes the right to legally sufficient notice of the alleged adverse action, the right to a fair hearing, the right to confront your accuser, and the opportunity to be heard. Elements of an Infraction – These are the statements in the law that identify what the government must prove to find liability when the law addresses a civil infraction or violation and guilt when the enforceable action is a crime. It is the burden of proof. Enabling Legislation - The legislation resulting from a bill which either creates a new law or allows a different set of rules and regulations to enforce any existing law (underlying legislation). FOIA – “Freedom of Information Act”: The federal government and all state and local governments have a procedure established to allow citizens to view most documents related to government activities. The Photo Radar programs have legislative histories, internal memos, proposals from the private contractors, and other documents which might be helpful in understanding and fighting the process. Once you make a “FOIA” request, the government has a limited time to respond. If the request is granted, you may be charged reasonable fees (e.g. copying). If the request is denied, you can appeal. Seek legal advice for the requirements in your area. Law – The basic umbrella of rules for social order established over time. They are the result of the codification of customs and traditions and generally become accepted after significant debate. There can be the “Common Law,” which as grown from the cases law over years of test in the courts. It can be legislative resulting from congress and the hearty debates of elected officials. Legislation – Those laws resulting from the bills presented for debate and review by the legislature and ultimately approved. They are listed, or codified in the “Legal Codes” for our country and for each state and local jurisdiction. Regulations – Those procedures established by agencies who have been delegated the authority to interpret a given set of laws. They tell the reader what the law means in practice. Rules – The practices established by the agencies to help enforce or otherwise carry out the mission of a given regulation. They tend to be internal guidelines. [TJ1]Due to spacing corner keeps looking like comer. [TJ2]In our lifetime or the next year? [TJ3]Is that the proper name or what is the newspaper? [TJ6]What do you mean by connecvts?